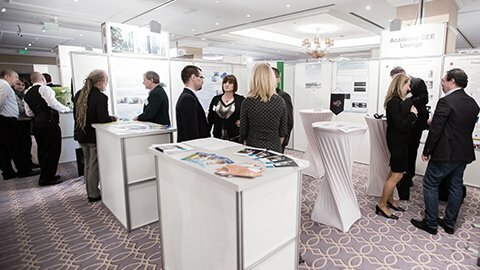 The market leading event - organised for the 8th time - took place in Budapest on 13 - 14 March 2018, with more than 400 senior decision makers of the most important companies in the Pharma and biotech sector gathering in the Corinthia Hotel Budapest to share and discuss their challenges and meet the key solution providers of the industry. Numerous meetings were conducted between the prominent participants during the two days, which clearly shows the crucial role PHARM Connect as a platform plays in the growth of Central Eastern Europe’s (CEE’s) pharmaceutical industry. For the first time at PHARM Connect Universities and Research Centres from the region were present within the Academic CEE Lounge in order to meet the high networking demand from pharmaceutical manufacturers and solution providers. TEG – the organiser - is supporting this initiative and provided a professional platform by creating a networking area for representatives from the Faculty of Pharmacy of the University of Szeged and Ljubljana and the Semmelweis University as well as from the Medical School of the Charles University, the University of Chemistry and Technology of Prague and from the Biomedical Research Centre of the Slovak Academy of Sciences and its Biotechnology and Analytical Laboratories. Pall Biotech • Thermo Fisher Scientific • Sanofi Industrial Affairs CEPIA • Aptar Pharma • PLASTRADE Packaging • Atlantic Zeiser • Blulog • Bürkert Fluid Control Systems • EXERGY • Com-Forth • SoftGroup • Patent • among many others. The conference programme has been extremely well received by the knowledgeable audience. Dr. András Illés, Deputy Head of Clinical Development of Biologics at Gedeon Richter opened the event with a keynote presentation. Eugenio Filippi, Associate Director Plasma Logistics & Analytics Europe, Shire held a fascinating laboratory case-study presentation about “How to Manage Process Deviations and Showcase your Data”. Furthermore, among the speakers include names of Britta Badertscher, Technical Specialist SLS, Pall International, Univ. Prof. Dr. Christoph Herwig, Head of Research Division Biochemical Engineering, Institute of Chemical Environmental and Biological Engineering, Vienna University of Technology, Christopher Hunley, Site Head and Managing Director, GSK Biologicals Kft., Massimo Bresciani, Executive Director Scientific Operations & Board Member, Research Centre for Pharmaceutical Engineering (RCPE) and Marek Cichocki, Head of Operational R&D, Polpharma. Furthermore, participants had the opportunity to visit the Research Centre for Natural Sciences at the Hungarian Academy of Science and Meditop Pharmaceutical, the winner of the 3rd CEE Pharmaceutical Manufacturing Excellence Award which developed an innovative approach to improve film coating efficiency by developing and applying a continuous film coater. Besides cutting edge presentations and pre-scheduled one-to-one meetings, informal activities made the networking focus of the event more colourful. The cocktail reception at the end of the first day was opened by Professor Stane Srčič, Faculty of Pharmacy University of Ljubljana, who announced the winners and handed out the 4th CEE Pharmaceutical Manufacturing Excellence Award to the Bulgarian company SoftGroup in the service provider category and to the Slovenian company Lek Pharmaceuticals in the manufacturer category, emphasising that these tried methods will encourage professionals to constantly raise standards and come up with outstanding manufacturing excellence solutions. Those who decided to set the pace, stay in the front row of market developments and keep the edge over competition, have all taken part and can share their experience with you further. You can reunite with them next year.